by JUSTIN SKINNER – reprinted from ‘The Weekend Review’ – Having seen both the good and the bad sides of the music business throughout his three-plus decades as a performer, D’Arcy Wickham is prepared for whatever the future holds. The guitarist is releasing his new CD, Feather Fingers, at an upcoming performance, and the solo effort represents a return to his roots. While Wickham has tackled rock, jazz, country, classical and countless other musical genres throughout his career, Feather Fingers contains folksy and intricate finger-style guitar. Wickham’s career began in the early 1970s. He graduated from the University of Windsor with a degree in business administration in 1970, but quickly found that the corporate world wasn’t for him. He quickly started playing locally, then embarked on two separate cross-Canada tours. 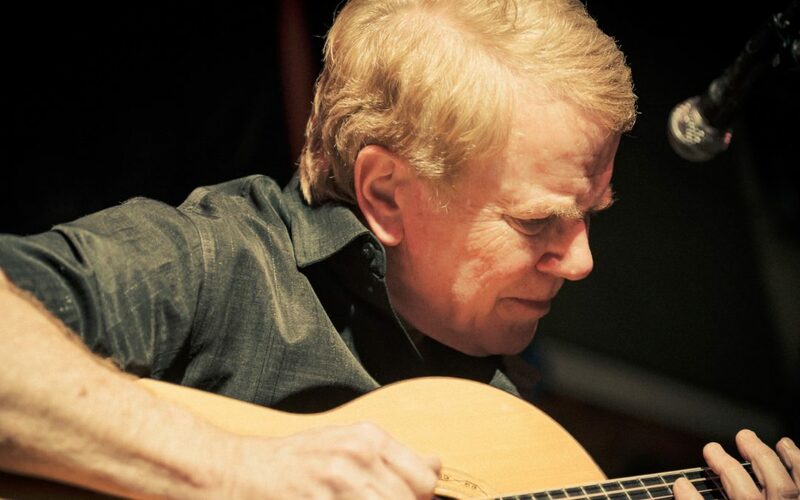 During those early days, he worked with noted Canadian guitarist Ian Thomas, performing distinguished venues across the country. Wickham’s first solo chart success came in 1976 with his single Old Fashioned Lady, which made its way up the country charts. Before long, however, the strain of touring took its toll and Wickham decided to stay in Toronto, settling into his home near Lawrence Avenue and Avenue Road and starting a family with his wife, Tess. He began focusing on giving guitar lessons and working with local band Party Lights. The band played rock music at weddings and other events, but also played for such clients as the NHL, the Ontario Liberal Party and the British Royal Family. “It took me 15 years to get my electric guitar playing together to the level where I wanted it to be,” he said. Throughout his career, he played with several high-profile artists, ranging from Daniel Lanois to Raffi. In 1996, Wickham decided once again to focus on his solo career, recording his first album, Dust and Loneliness, independently. Before releasing the album, however, he wanted to ensure that every song met an exacting standard. “Because of midi (computer recording equipment), anyone can produce a record that’s digitally perfect, but you can’t make a good artistic record without good songs, good singing and good playing,” he said. In order to achieve his goal, the process proves painstaking at times, but Wickham’s passion and dedication to his music ensures that he does not settle for anything less than every note and lyric being exactly the way he wants it. In spite of his tireless efforts, Wickham said he almost expects the record to lose money. His primary source of income is in providing guitar lessons in a variety of styles to everyone from beginners to seasoned veterans. His reputation as a virtuoso guitarist led such international talents at Gordon Lightfoot and David Wilcox to refer clients to him. His love for the music and his belief in his songs keep him in the writing game, however. Wickham will release Feather Fingers at a CD release party at Hugh’s Room, 2261 Dundas St. W. on Thursday, March 10 at 9 p.m. Tickets are $12 in advance, $15 at the door. Profits will be donated to the Bloorview MacMillan Children’s Foundation. For information or to reserve seats, call 416-531-6604.